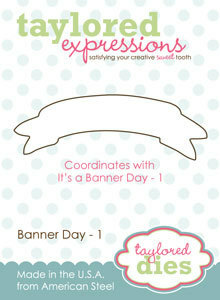 Taylored Expressions Sneak Peeks - Day 1 !!! It's release week over at Taylored Expressions (wooooohooooo!) and today, the Baker's Dozen are welcoming the warmth and sunshine of spring with some major cute and adorable stamp sets and dies!!! I know that I am so ready to be done with winter and I absolutely loved creating my cards with these super happy sweet spring stamp sets and using the new Spring Project Pantry kits: All of these super sweet sets today and this week will be released on Thursday, March 3 at 8am PST! This second card uses the brand new to be released stamp set: It's a Banner Day 2 which has a coordinating die and some super super awesome sentiments that can be stamped into the banner. 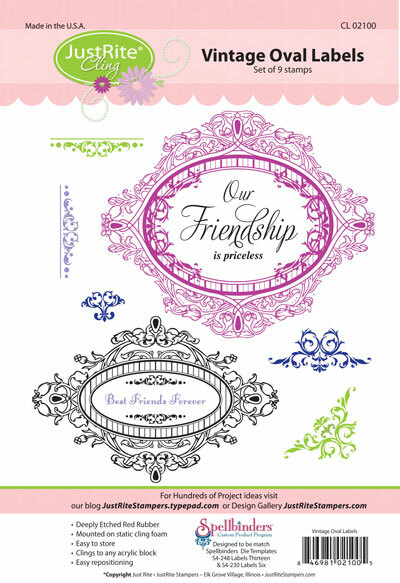 I used this stamp set with the sentiment: Happy Anniversary with the previously released stamp set: Favorite Peeps. I cut out a heart and matted it and stamped the image of the sweet birdie from the Favorite Peeps stamp set inside with the hearts from the Kid at Heart stamp set. I added the Banner Day 2 swirl at the bottom of the heart and finished it off with ribbons and papers from the February Key Ingredients kit. 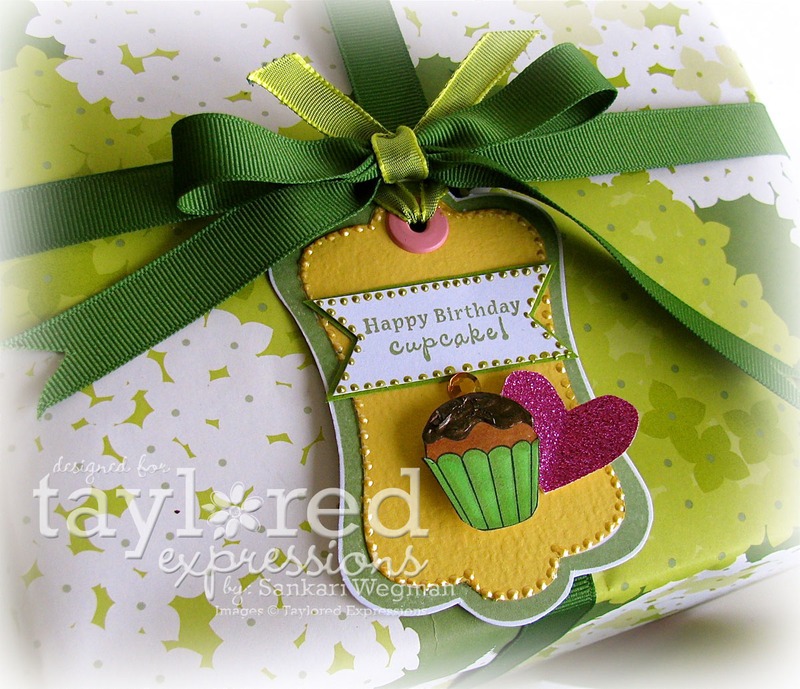 Stamps: Favorite Peeps, Kid at Heart (hearts) and sentiment and banner from Banner Day 2 from Taylored Expressions. I loved creating these spring-y cards and can't wait to see what the Baker's Dozen has cooked up for today's sneak peeks! 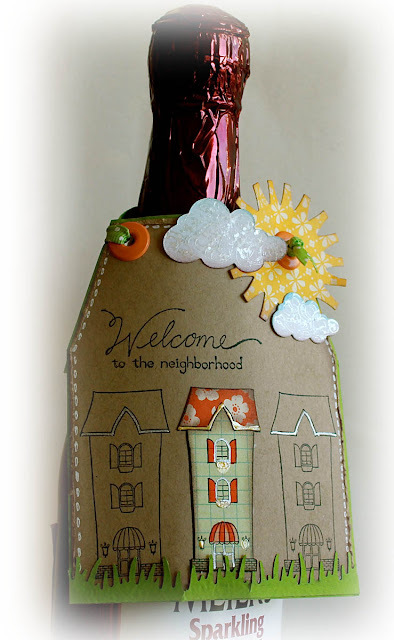 Hop on over with me and check out their sweet creations! Thanks so much for stopping by today! Please hop in tomorrow for Day 2 of sneak peeks! JustRite Stamps is introducing so many amazing and beautiful new stamp sets - one of which is this gorgeous stamp set called Vintage Oval Labels. This stamp set is simply gorgeous and has these gorgeous oval frames and comes with different embellie stamps that you can stamp around the card for embellishment. I loved the frames and wanted to focus on one of the large frames. I stamped the frame onto kraft cardstock and then stamped the same oval frame again on a different piece of kraft cardstock. I cut out the center after stamping the sentiment: "Our Friendship is priceless" in the middle and popped it up on the frame. I colored in the edges with copics with blue and brown and finished it by adding a bit of glitter to the top of the frame and lined both edges with a border edge punch. There are some amazing new stamps that are being released this month that are joining the fantabulous JustRite Family - please check out all the details here at the JustRite Stamp site and you can check out all the creations with all of these stamp sets over at the JustRite blog here. One of our dearest friends became engaged to another dear friend and I am so excited for her wedding coming up later this year! I wanted to send them a congratulations card that was bright and happy and full of our happy wishes :) I used the VLV sketch #3 from January that Teresa had created for this card and used the Up, Up and Away stamp set with the sentiment: Together for Ever from the Love Notes stamp set from Verve stamps and used one of the sweet little hearts from this stamp set along with the heart from the Text Objects stamp set from Verve. I love all of the balloons from the Up, Up and Away stamp set and its always hard to decide which one to use - but I used the circle one because then I could paper piece it with one of the DP's from the MME Love Me Do papers. I added a little heart from the Love Notes stamp set and added a little glitter to it and put it on the center of the balloon. Stamps: Up, Up and Away stamp set, Love Notes stamp set from Verve (sentiment) and stitched heart from the Text Objects stamp set from Verve. Thanks so much for stopping by today - also - please be sure to stop by the Verve blog for more Verve-y goodness - and the SCS Verve forum for all the new March sketches! 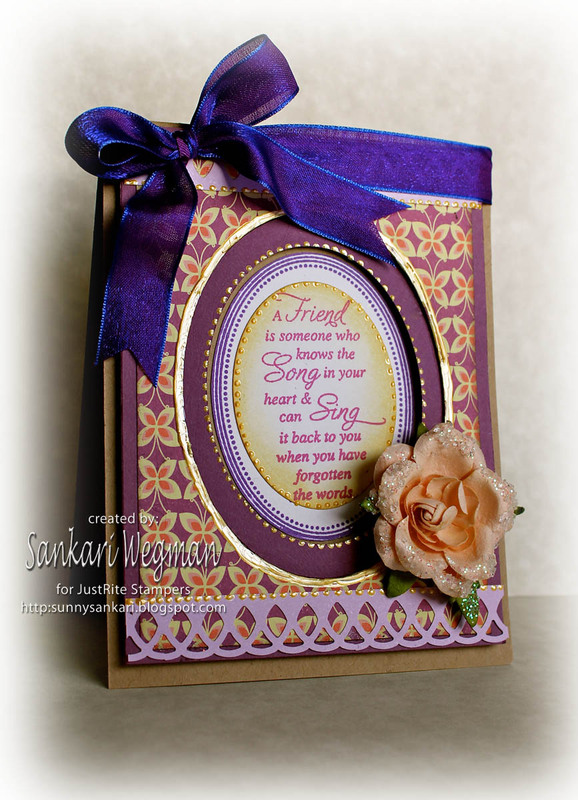 Today JustRite stampers are featuring a gorgeous new stamp set for our March release called: Song in My Heart (Borders and Centers, Interlocking). This stamp set features the oval sentiments with gorgeous oval borders and the sentiments are simply beautiful - so uplifting! I chose to use one of my favorite sentiments: "A Friend is someone who knows the Song in your heart and can sing it back to you when you have forgotten the words." I love this sentiment! Because the sentiment is oval - I wanted to create lots of oval frames and so I popped up the DP with the oval frame cut out and popped up the oval frame and sentiment with different dimensionals in the center. I went for a purplely color scheme with a little bit of peachy orange like the CC papers and added a little liquid pearl to the edges. 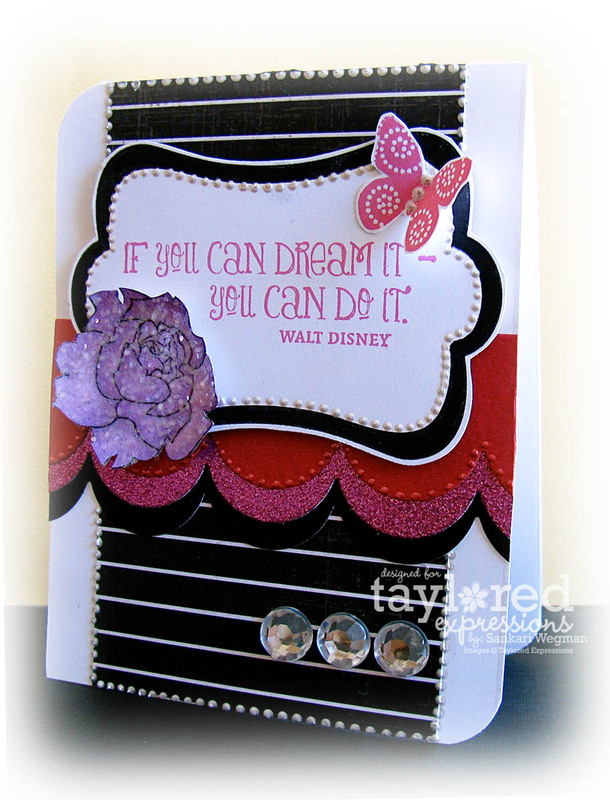 I finished off the card with a little border and a liquid pearl border and glittered sugar flower on the bottom corner. This is such a wonderful sentiment and perfect for any occasion for friend (birthday, thank you, friendship, thinking of you, etc.). Please check out the JustRite blog for more details and samples of this gorgeous stamp set! 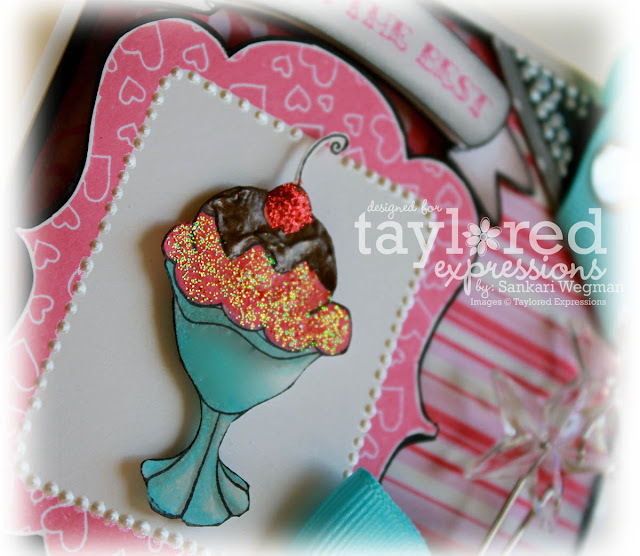 Every month, Taylored Expressions hosts a customer and fan blog hop where we feature all of the wonderful previously released stamp sets from Taylored Expressions. This month the theme was to GO GREEN! Well, I love green - it is one of my most favorite colors and I was all set to make a Lucky CHarms card, but then I saw one of my favorite sets lying out: Hangin' Out - and so I switched gears and couldn't wait to play with this set! 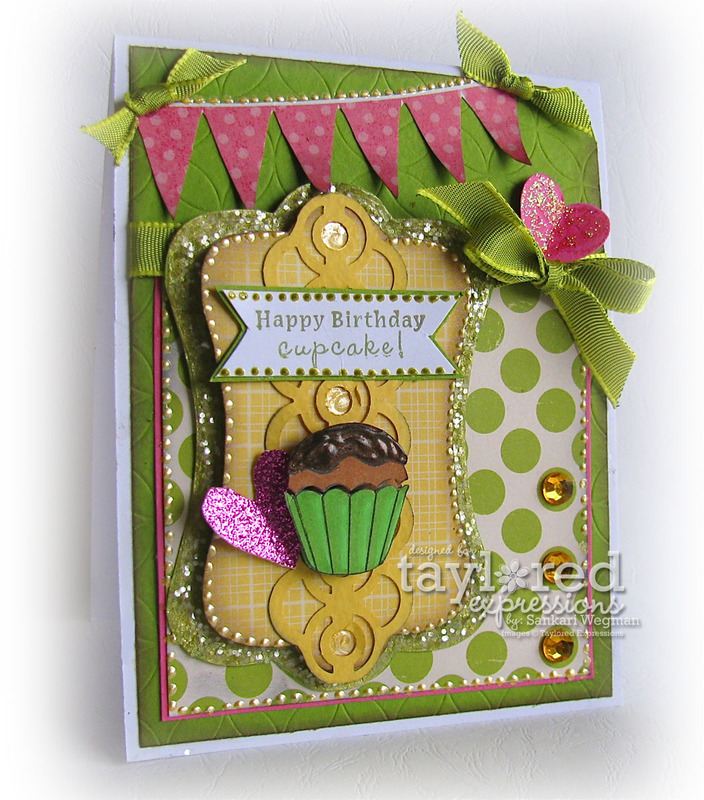 I used the sketch that is optional for this blog hop and got my "green" on! What was funny - is that I started to make my card, forgot about the sketch and then remembered at the last moment before putting it together - phew! :) I love this dress stamp that is in this stamp set and paper pieced this dress with one of the DP's from the Feb. Key Ingredients kit. I also used one of the new dies: Clouds Duo from Taylored Expressions to create the clouds and finished them off with some liquid pearls and finished the whole thing off with a little white gel pen. 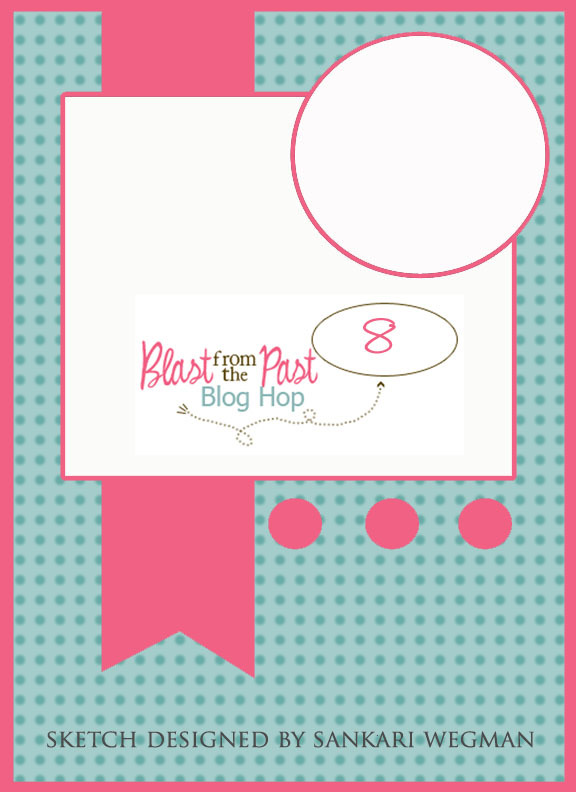 I can't wait to surf around and see all the stamp sets that everyone is using for this blog hop! Please check out the amazing creations! 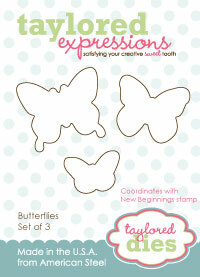 THere is also one PRIZE for one lucky hopper who will receive a FREE Taylored Expressions Stamp set of their choice and Taylor will also be choosing another creation that will be featured in the TE Newsletter!!! 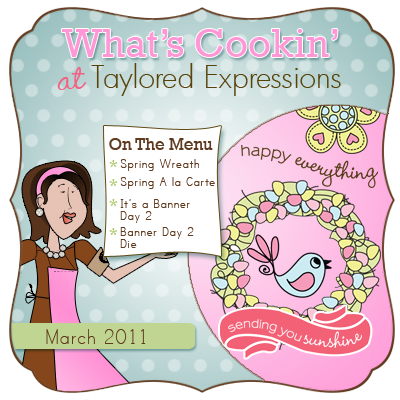 Be sure to check out Taylored Expressions for the info on next month's blog hop! 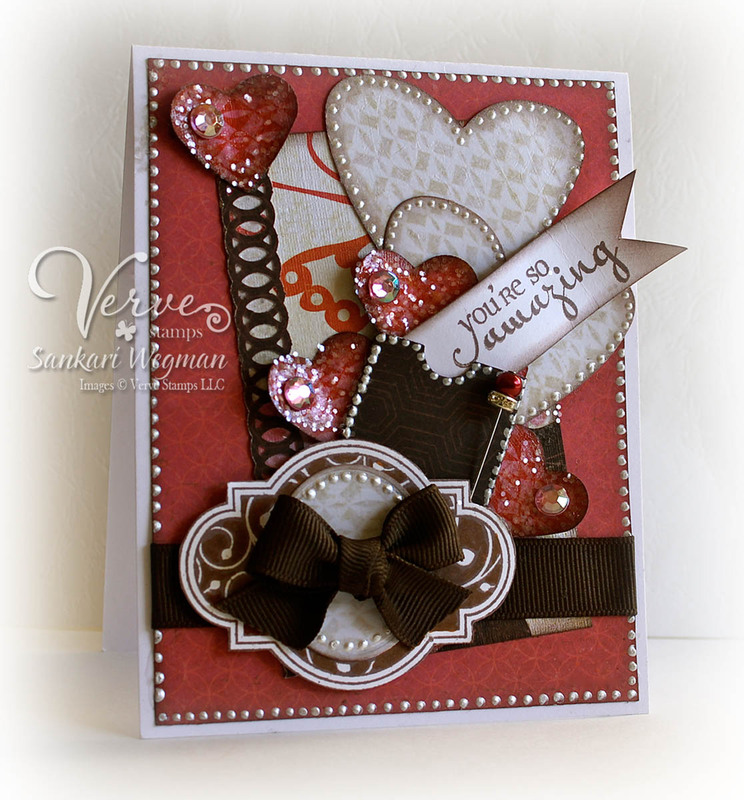 There are some amazing JustRite stamp sets that are brand new and full of gorgeousness! One beautiful new stamp set is called Heart to Heart Borders and Centers (Interlocking) and is part of the JustRite Cling family of stamps and features a mix of oval borders with rectangle centers. I love the details of each of the borders and each of the sentiments are gorgeous and interchangeable with the border. The sentiment: "Loving Thoughts" really caught my eye - it is so multi-purpose with how you can use it and I thought that I would create a simple card that could be for any occasion (sympathy, friendship, thinking of you, get well, etc.) I chose to have a simple palette: black and white and a soft color. 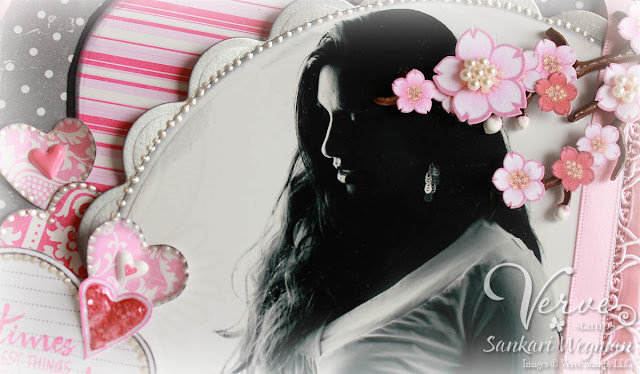 I embossed the border in white and then popped up the center sentiment on a piece of rose colored paper and finished off the oval border with some white liquid pearl droplets. It was so simple and quick to create and thought it would be sweet to add a little butterfly to the bottom corner and a little liquid pearl scalloped row. 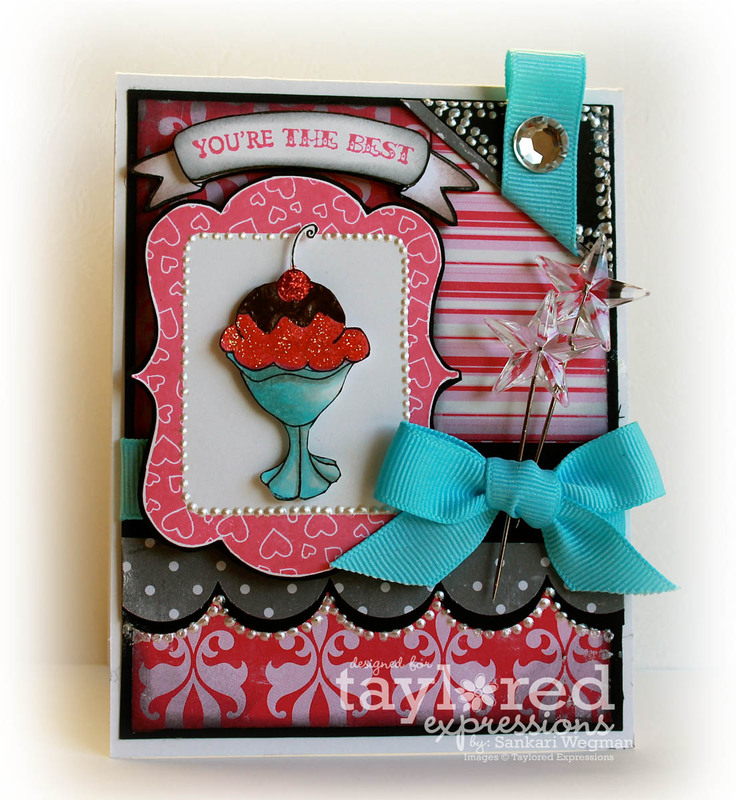 You can find so many beautiful samples that are on this JustRite blog that feature this gorgeous stamp set! Thanks so much for stopping by! JustRite Stamps: Fancy Tags: HEartFelt Thanks! I stamped the tag twice and then stamped the sentiment in one of the tag frames. I cut out the sentiment and popped it up on the fancy tag that I stamped in RoseRed ink. I added some embellies and liquid pearls and a little butterfly to the side. I also punched out a border on the bottom and added some liquid pearls to the border. I love how this card turned out! It was so quick and simple and that is always a plus! 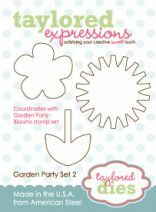 I love these Cling stamps from JustRite - they stamp so beautifully - you can check out all the Cling stamps that JustRite has over here! 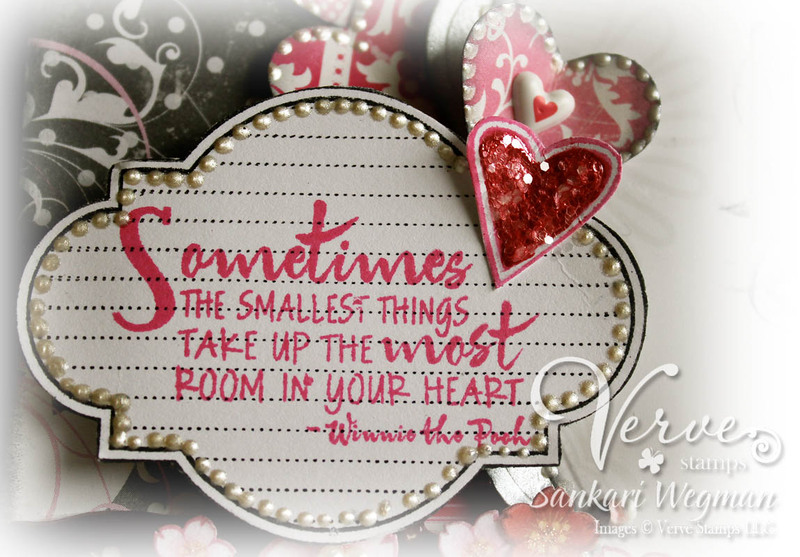 Here is a little scrapbook page made for the little Valentine when she was in her mother's belly and I used the Be Mine Echo Park papers for this 8x8 scrapbook page along with one of my most favorite sentiments from Verve's Plain Janes: Smallest Things which says: Sometimes the smallest things, take up the most room in your heart" (by Winner the Pooh). I love this saying and placed it next to my friend's beautiful belly :). I wanted to keep the palette more grays and pinks - and so I went with some different heart motifs punched from the different DP and added some cherry blossom embellies to her hair and bottom corner. I then Framed the 8x8 scrapbook page in a shadowbox - it was hard to take a picture where the reflection did not glare - so I am sorry about the angle of the photo. I love that there are a lot of dimensions in this page and I love the muted baby girl colors - but most of all I love and adore this picture and am so glad that her little baby girl is here! yay! 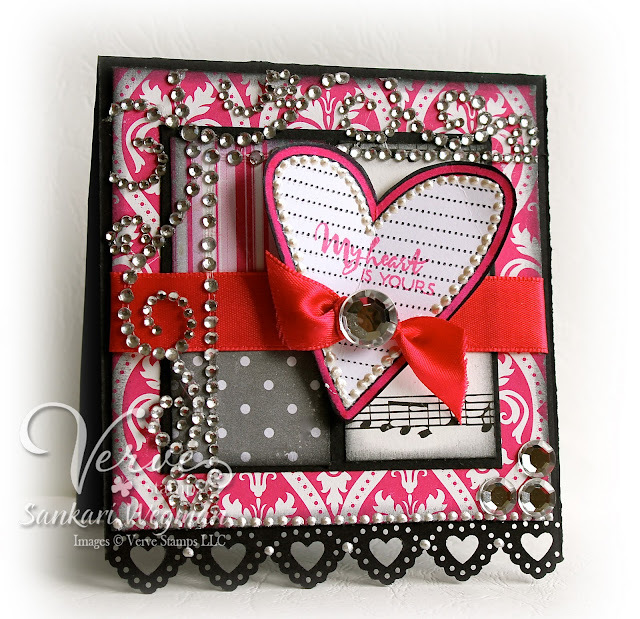 Accessories: liquid pearls, grand label dies, dimensionals, flower embellies, MS heart punch, Doodlebug Designs glitter, stickles, ribbon from scrap and 8x8 frame. I loved the whole process of making this present for my friend and I am so excited for her in this new journey that she is beginning with her little girl :) Now, I can't wait to make a little scrapbook page of her little baby girl! VLV FebSketch #3 - You're So Amazing! 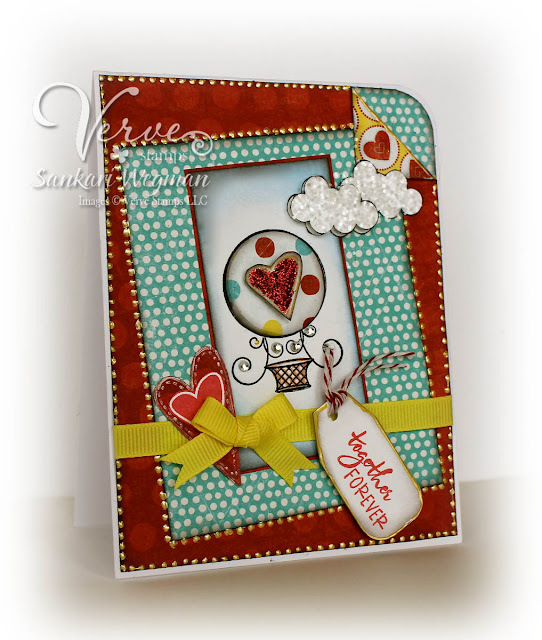 Every Friday over at SCS, there is a new Viva La Verve sketch to play along with and this week the VLV Sketch #3 for Feb 2011, is hosted by the lovely Teresa Klines with this beautiful sketch! I love all the fun elements in this card and couldn't wait to sit down and create a little somethin' somethin' :) But the only problem was that once I started creating a card, it kinda took a mind of its own and then when I looked down I realized that kinda interpreted the sketch kind of "loosely" :D .
I really loved making this card - it was sooo lovely to get some stamp therapy today and I can't wait to see all the lovely creations that have been created with this great sketch over at the gallery. Check out this post to get the scoop on how to play all 4 sketches this month and how if you do that - you could win some yummy Verve stamps! YOU guys are so amazing!!! Lots of happy wishes for a wonderful weekend! It's been so long since I have played along with the lovely ladies over at the Color Throwdown and as soon as I saw this awesome and fun color combo, I totally wanted to play along and couldn't wait to play. I loved the different tones of red and pink and then the pop of purple with the black was really such a cool color combo! Accessories: liquid pearls, bling from Bazzill, corner chomper, Frame it Up Die #1 from Taylored Dies, Big Scallop die from Taylored Expressions, copics and dimensionals. Hope your day is warm and lovely! So it is officially freezing here - because its in the minus degrees! My sinuses are frozen along with my bones! Time for some warm tea and cupcakes to warm up :) lol! Speaking of cupcakes, I made a little cupcake card and coordinating gift tag for her present using one of my favorite Taylored Expressions stamp sets: For the Love of Cupcakes :) I adore all the cupcakes and sentiments in this set and I used the frame from the New Beginnings stamp set and coordinating Frame It Up die to create the tag and used it for the image panel as well. I love this panel (love love love love it :) its big enough for a tag or for holding both sentiments and images in an A2 card :) love that :) It was hard to figure out which of the awesome sentiments to use, but i had to go with the sentiment: "Happy Birthday Cupcake" - love that! I stamped the cupcake twice and then colored it with copics and covered the chocolate with expresso dimensionals and cut it out for both the tag and card. It was so fun to create this mini- ish card (3.75 x 3.75) and it was really quick and simple - gotta love the quick cards! Can't wait to make more of these and change the sentiments around a little :). I love this sketch - and you can check out more of the details on how you can play along with this sketch and the rest of the VLV sketches for Feb. and how you can win some yummy Verve stamps!!! Hope you have a wonderful rest of your weekend! 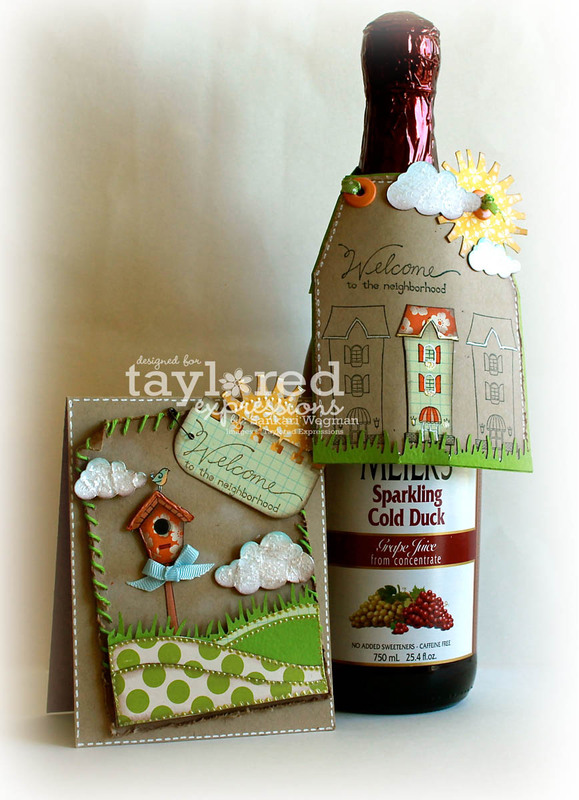 Today is Day 3 of sneak peeks over at Taylored Expressions where today the Baker's Dozen is featuring an awesome new stamp set called: It's a Banner Day 1, which comes with a coordinating Banner Day 1 die!! I love brand new dies! This stamp concept comes from the amazing Iwona Palamountain! This stamp set comes with 3 awesome banner shapes and all-around sentiments that coordinate with all stamp sets - so I chose to coordinate my banner project with one of my favorite stamp sets: Sprinkled With Love. I made this card for a very dear friend of mine - she is simply the best! I can't even express how dear she is to me and I feel so lucky to have such a great friend and I can't wait to send this to her (I know you might be reading this - so please pretend to be surprised when you get it in the mail :) I used the Be Mine papers from EP and added a little blue ribbon for pop. Accessories: star pins, ribbon and bling from stash, dimensionals, copics, Expresso liquid pearls, Fruit Punch stickles, Christmas Red Stickles, EK success scallop punch and Banner 1 die from Taylored Expressions. Stop by tomorrow for Release Day festivities!